Background and Objective: Recent interest in better cosmetic outcomes promoted single incision laparoscopic surgery (SILS) in a variety of target organs. 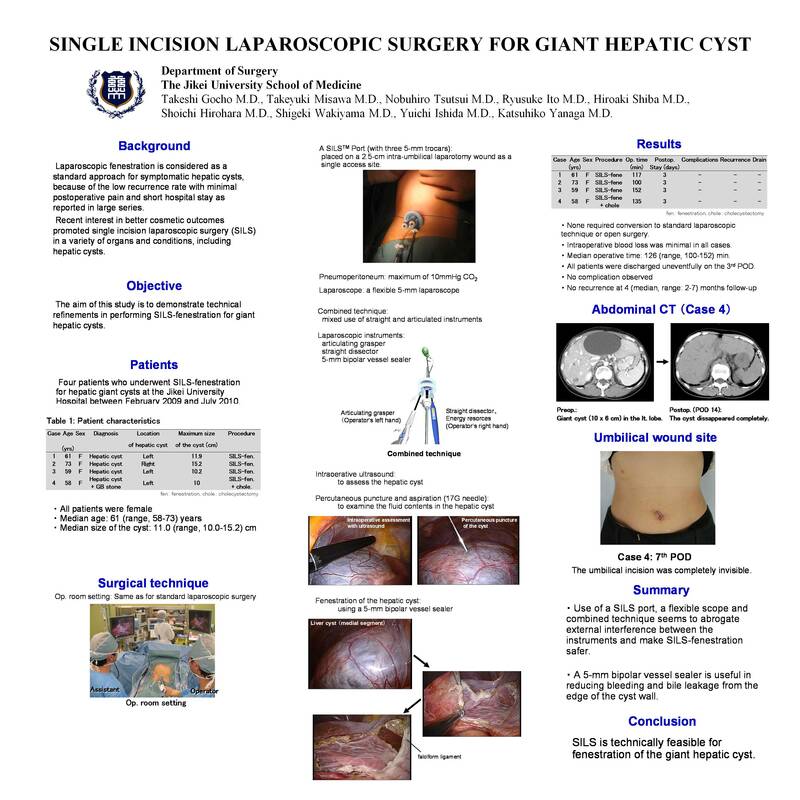 The aim of this study is to demonstrate technical refinements in performing single-incision laparoscopic surgery for fenestration of the giant hepatic cyst (SILS fenestration). Patients and Methods: Between February 2009 and July 2010, we consecutively performed 4 cases of SILS-fenestration for a hepatic giant cyst: 4 females with the median age of 61 (range, 58-73) years. According to preoperative CT, the location of the cyst was in the left lobe in three and in the right lobe in another patient. The median size of the cyst was 11.0 (range, 10.0-15.2) cm. The operating room setup was the same as for standard laparoscopic cases. The surgeon stands on the right side and the assistant on the left side of the patient. Under general anesthesia, a 2-cm intra-umbilical skin incision was made for a 2.5-cm mini-laparotomy. A SILSTM Port with three 5-mm trocars was then placed on the laparotomy wound as a single access site. Under the maximum of 10 mmHg CO2 pneumoperitoneum, a flexible 5-mm laparoscope and an articulating grasper were used in addition to standard laparoscopic intstruments. Before fenestration, the cyst was examined by laparoscopic ultrasonography, then percutaneously punctured and aspirated by a 17G needle for decompression and examination of fluid contents. To avoid bleeding and bile leakage from the edge of the fenestrated cyst wall, a 5-mm bipolar vessel sealer was used for all dissection of the cyst wall. A drain was inserted only in the first patient. Results: SILS was successfully performed in all patients, and none required conversion to open surgery. Intraoperative blood loss was minimal in all cases. Median operative time was 126 (range, 100-152) min. All patients were discharged uneventfully on the 3rd postoperative day. Median postoperative follow-up at 4 (range, 2-7) months did not reveal any complications nor recurrence. The umbilical incision was completely invisible. Conclusion: SILS is technically feasible for fenestration of the hepatic giant cyst. The long &ndash;term clinical, cosmetic and functional advantages require further analysis in a large series.